Illinois is in its fifth month without a state budget and the consequences of the political standoff between Gov. Bruce Rauner and Democratic leaders are becoming even more intense for Chicago. The Chicago Teachers Union yesterday raised the specter of another strike by calling for a test strike vote for this Thursday. That's in reaction to Chicago Public Schools saying thousands of teachers will receive pink slips as early as January unless $500 million in state aid comes through. This all comes after Mayor Emanuel and Gov. Rauner have traded barbs—and possibly some dead fish—over how to resolve the budget impasse that is sucking all of the oxygen up in Springfield. Joining us to talk about all of this and more are "Chicago Tonight" reporters Amanda Vinicky and Paris Schutz, and WBEZ Illinois political reporter Tony Arnold. On the Rauner and Emanuel feud—is it real? “This is the first time that all of the five top leaders from the Senate and the House and the governor will be sitting down together since May 29,” Arnold said. While there are still questions as to where the meeting will be held and whether or not it will be live or streamed online, there are also questions surrounding what the meeting is expected to accomplish. "The point of it is to make the other side look bad on TV," Schutz said. "In essence, a budget deal is harder now than it was five months ago because starting Nov. 23, candidates are going to start filing petitions to run for office." Interview highlights represent a condensed version of our conversation. Watch the video to see the full discussion. Chicago teachers begin steps toward another possible teachers strike, as Chicago Public Schools announced big layoffs on the horizon. Last week, Joel Weisman and his guests discussed the friendship between Mayor Emanuel and Gov. Bruce Rauner and asked, Is there really a feud growing between them? 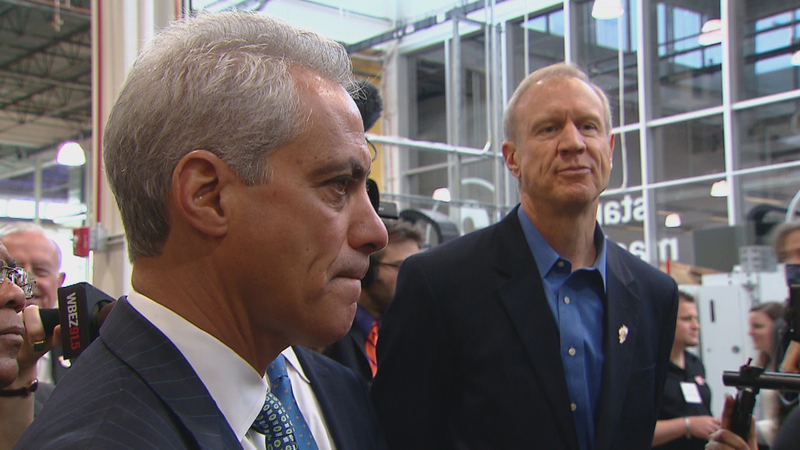 "I'm not going to allow Springfield's dysfunction to become Chicago's dysfunction," Mayor Rahm Emanuel said during an extended interview before last week's City Council vote on his proposed budget. “I think when the governor looks at our whole budget, he’ll see that we didn’t leave any stone unturned," Emanuel said about a plan to exempt low- and middle-income homeowners from the coming city-wide property tax hike. A plan to provide nearly $500 million in relief to the cash-starved CPS is locked up in an ideological battle over collective bargaining. Emanuel: “We shouldn’t deny the state the type of progress that bill represents for ancillary items that are not essential." "I don't think that children of the city of Chicago should continue to be played as a pawn in another agenda item," Emanuel said on "Chicago Tonight." "What's happening here, and the reason there's no progress, is a lot of name-calling and a lot of finger-pointing."